The MR32 combines heavy duty, quality steel frame and reel construction with the simple, yet maneuverable two wheel design like it's smaller counterpart-the MR25. Build to withstand heavy use, the MR32 operates from a 1 inch line (or 3/4" hose if flow and pressure is adequate) and allows irrigated areas up to 300 feet long and 120 feet wide for sports fields, horse arenas, hobby farms, or any area up to 4 acres. The MR32 is also available with a hitch kit making it compatible for towing with an ATV or small garden tractor! 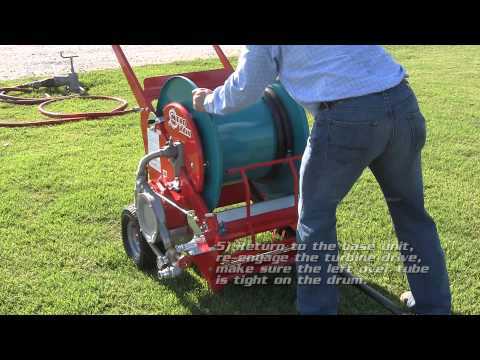 An excellent reel irrigator for many different applications! View the full performance chart for coverages and application rates. Machine Weight (Dry) - 315 lbs. Palletized Weight - 376 lbs.